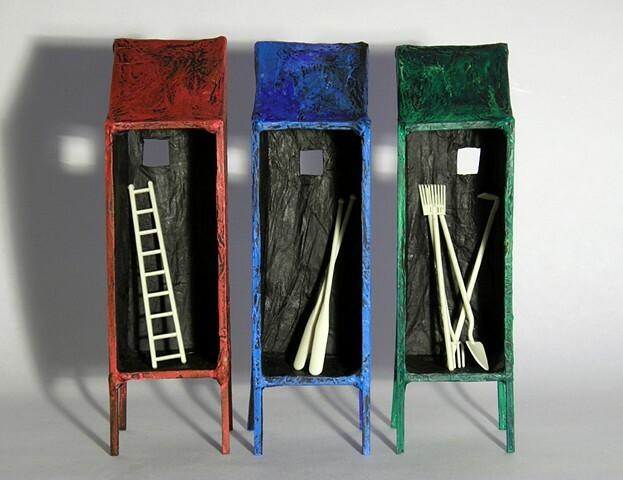 Maintenance Sheds (or Ways of Escape) is a reliquary triptych that invites the viewer into three distinct interior spaces, each with a window, and each with miniature objects typically found in outdoor sheds. The toys are from a 1970s game of pick up sticks. Considered as functional tools, each grouping has both positive and negative connotations: The ladder could be used to get from low point A to high point B, the oars to paddle in a peaceful lake, the rake, shovel, hoe and pitchfork to tend to a yard. Conversely, the ladder could be used to get out of the window, the oars to paddle away downstream, and the yard implements to tunnel out under a barrier.